Today I have a few snazzy looks from Pure Ice's new Puttin' on the Glitz Holiday Collection (press release here). I was excited to hear that Pure Ice is adding some nail art sparklies to the line to spice up our manis. I believe all of the polishes in this collection are repromotes from past collections or part of the core line. What's new are fab glitter pots in 12 colors. In this post, I'll be showing you looks using Purple (3248), Gold (3252) and Black (3241). 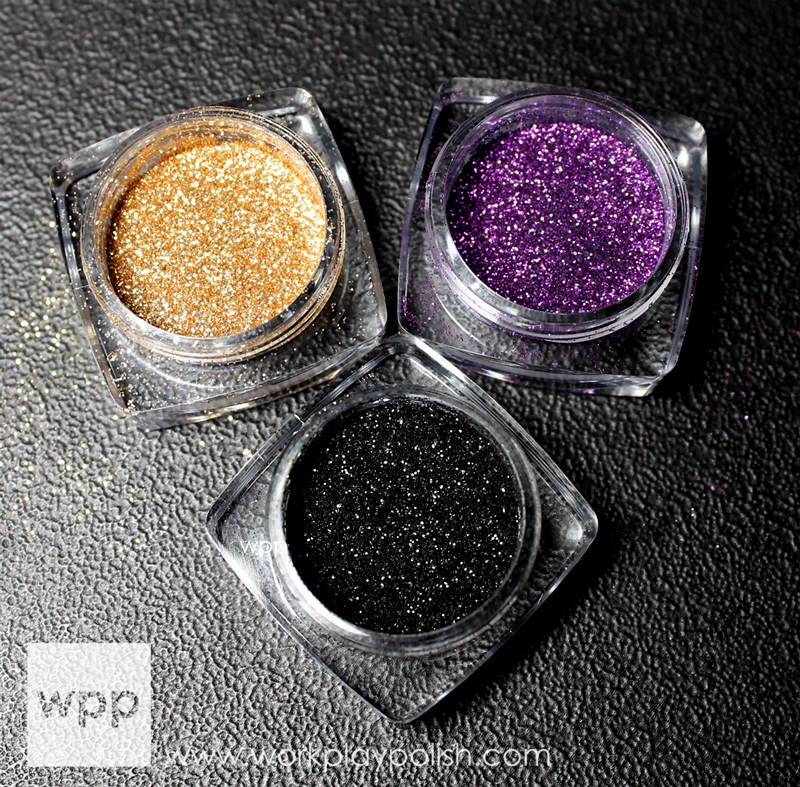 This first look is base of Royal Flush, a super shimmery purple/gold metallic. I added a single accent nail with the purple glitter while the top coat was wet. It's a little tricky to get your entire nail into the pot. I dipped a dry makeup brush into the glitter and sprinkled it in a few bare spots at the cuticle line. The glitter is very fine and super twinkly and the finish very textured. I love how this is monochrome. The accent nail is subtle, but blingy. 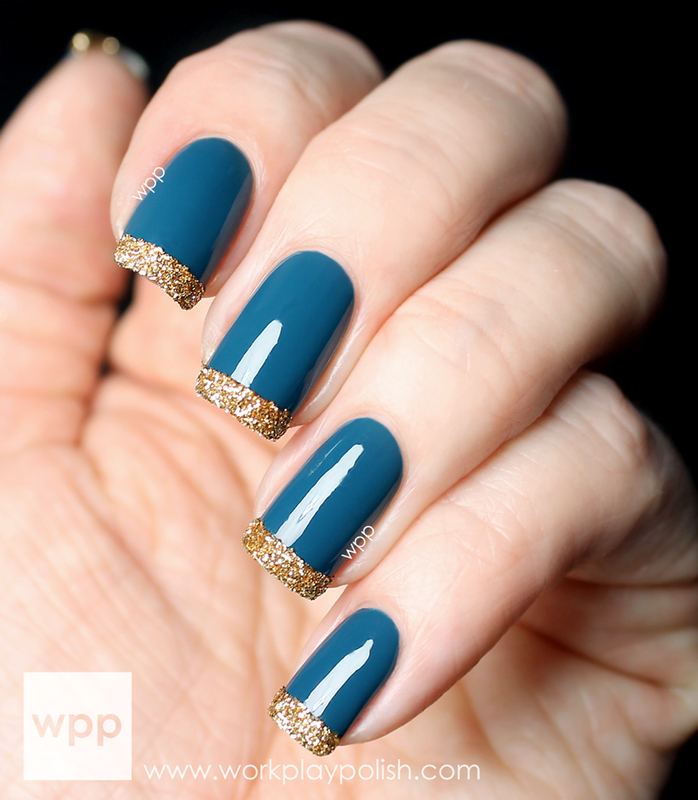 The next look is Pure Ice Internationally Known, a deep creamy teal, with gold french tips. I started with two coats of polish and topcoat and waited until it was absolutely dry. I taped off my tips (to keep glitter off the nail bed) and one-at-a-time polished each tip with additional topcoat, dipped it in the glitter, blew off the excess, and removed the tape. I love how this turned out! And the last look is a base of Viva Las Vegas. It's a muted vintage gold with a delicate shimmer and a little sparkle. After topcoat and some patient waiting, I taped off a "V" shape on each nail. Then, like before, added the glitter with more top coat and removed the tape, one-by-one. The black is really beautiful in person. I should note that the Pure Ice directions state to polish your base color, wait 30 seconds, then dip your nail into the glitter. I was unable to get the glitter to stick consistently with this technique. But top coat worked like a champ! I also washed my hands and the glitter dried back to it's regular state. And here's a tip...use tape to get stubborn wayward glitter off your skin! The glitter is really fine and sparkly and for $1.99 and easy access at Walmart (instead of ordering online), I believe these are a great add to the Pure Ice line up. What do you think? The Pure Ice Puttin' on the Glitz Collection is available at Walmart stores nationwide. For more information, visit www.pureicecosmetics.com or follow OfficialPureIce on Facebook, Twitter and Instagram. Join the conversation by using the hashtag #PureIceglitz.